Hassan Nasrallah: Mideast Man of the Minute If Sheikh Hassan Nasrallah survives the current cross-border fighting, the leader of the terrorist group Hezbollah could emerge as one of the most influential leaders in the Arab world. A brief look at his past and present actions. In April, he warned that his operatives would seek to abduct Israeli soldiers. And on July 12, his warning was realized. Hezbollah operatives, under the guidance of Sheikh Hassan Nasrallah, staged a deadly, cross-border raid into Israel that left eight Israeli soldiers dead and two abducted. If he survives the current cross-border fighting, Nasrallah, leader of the terrorist group Hezbollah, could emerge as one of the most influential leaders in the Arab world. Here's a brief look at his past and present actions. Early Years: A grocer's son, Nasrallah was born in south Beirut in 1960. In his youth, his commitment to study and his charisma caught the attention of influential Shiite clerics in northern Lebanon. By the age of 16, he was sent to study theology at the Shia seminary in Najaf, Iraq -- one of the spiritual centers of Shiite Islam. 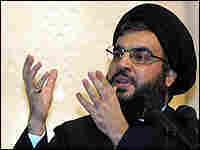 But in 1978, the often anti-Shiite Iraqi regime expelled Nasrallah and hundreds of radical Lebanese Shiite clerics. Over the next four years, he became increasingly involved with the radical Shiite Amal movement in Lebanon. At the time, Lebanon was in the midst of its 15-year civil war. Nasrallah and other prominent, young Shiite radicals soon came to believe that Amal was becoming too secular. When Israel invaded Lebanon in 1982 -- part of an effort to crush the Palestinian Liberation Organization -- Nasrallah broke away from Amal and joined the newly-established Hezbollah -- or Party of God. Nasrallah was regarded as a strong, charismatic orator and a good organizer. What He's Like: "Softspoken" and "extremely serious," according to those who know him. "He speaks like a military commander," says Adam Shatz, who wrote a series on Hezbollah for the New York Review of Books. But as a public orator, his rhetoric is often lofty, and even somewhat hyperbolic. Though he is an Islamist, his focus is often on pan-Arab themes harking back to the 1960s and '70s, when leaders spoke of "driving Israel into the sea." Current Position: He's been the secretary-general of Hezbollah since 1992, after Israel assassinated his predecessor, Sayyad Abbas Musawi. The group is widely believed to be one of the best-trained and funded militant organizations in the Middle East. Nasrallah is also a key figure in Lebanese politics. His movement is a political party represented by a deputy in the Lebanese cabinet and several members in Parliament; it has established a wide social network in south Lebanon providing funds for schools, hospitals and food pantries. Largely for these reasons, Nasrallah has managed to form a strong base of support among poor Shiites in Lebanon. But as Hezbollah has further solidified its relationship with Iran and Syria, the group has become more powerful. Iranian military officers have helped train Hezbollah operatives to carry out attacks against Israel. Throughout the Arab world, Nasrallah is seen as a hero -- a leader capable of inflicting pain on Israel. Role in the Crisis: Nasrallah is one of the main engines driving the latest fighting. He understands the importance of propaganda and opposes any normalization of relations with Israel. But Nasrallah also believes that Israel understands the use of force and he's had success, in the past, forcing Israel's hand when it comes to negotiations over prisoner exchanges. In 2004, Israel released hundreds of Palestinian prisoners in return for an abducted Israeli businessman and the bodies of three Israeli soldiers. But there may be other motivations behind this latest round of attacks. One theory is that Iran wanted Hezbollah to divert international attention from Iran's nuclear program. Hezbollah's Track Record: The organization has been implicated in a series of terror attacks, including the 1983 bombing of U.S. Marine barracks in Beirut that left 240 dead, and is widely believed responsible for the 1992 attack on the Israeli embassy in Buenos Aires and the 1994 bombing of a Jewish cultural center in the city. Hezbollah also pursued a low-intensity war against Israeli forces occupying south Lebanon. In 1993, a year after Nasrallah took the helm of Hezbollah, his operatives killed 26 Israeli soldiers, who at the time, were part of a security contingent occupying a part of southern Lebanon. The mounting Israeli casualties in southern Lebanon are widely seen as the reason Israel eventually withdrew its army from the area in 2000. For Hezbollah, the withdrawal was regarded as a victory. 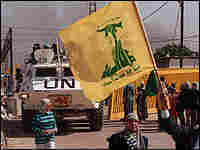 Hezbollah was formed in 1982 as a response to Israel's occupation of southern Lebanon. The name means "Party of God," and the group derives its ideological inspiration from Iran. Hezbollah garners moral support and financial assistance from both Iran and Syria, but analysts say the group acts independently. And over time, its original aim of driving Israel out of Lebanon has expanded into a powerful political and social force among Lebanon's Shiite Muslims, and possibly beyond. Hezbollah entered Lebanese politics since 1992, and currently holds 14 seats in Lebanon's 128-seat national assembly, as well as the cabinet post of minister for water and electricity. It also draws support through its own private network of social and educational services. Its crowning achievement, though, was to force Israel's military to end its 22-year occupation in May 2000. At the time, the militant group received widespread praise, including from Christian and secular Lebanese who opposed its hard-line ideology. But even as some hoped Hezbollah would then give up its arms and morph into a strictly political entity, Hezbollah set about expanding its influence. Despite persistent international pressure, the group did not abandon its weapons nor deploy away from the Israeli border. And Lebanon's fragile government -- a delicate balance of the country's Shia, Sunni and Christian communities -- was not strong enough to force those measures. Lebanon found itself in a bind after it promised to disarm all "militant" groups. But earlier this year, according to Anthony Cordesman of the Center for Strategic and International Studies, the government avoided a showdown by designating Hezbollah a "resistance" force against Israel instead of a militia. In this way, according to a State Department report Cordesman cites, Lebanon also exempts Hezbollah from money laundering and terrorism financing laws. Just after the Israeli pullout, Hezbollah's TV station, Al-Manar, also went on satellite. One member said, "in this way, our jihad will continue." The channel carries an odd mix of children's programming, anti-Israel game shows, and militant propaganda. Al-Manar has been banned in France, and declared a terrorist outfit by the United States. In March 2004, again according to a State Department report, Hezbollah signed an agreement to join the Palestinian group Hamas in joint attacks against Israel. Hezbollah leader Sheikh Hassan Nasrallah has publicly referred to this assistance. And in recent years, Israel has accused Hezbollah of illicitly shipping arms to Palestinians via the Mediterranean Sea. There is a long list of terror acts for which the United States and others blame or suspect Hezbollah, all the way back to suicide truck bombings of the American embassy and Marine barracks in Beirut in 1983. The list also includes the 1985 hijacking of a TWA flight, in which a U.S. Navy diver was killed, and attacks on the Israeli embassy and cultural center in Argentina in the1990s. Hezbollah has also seized Israeli soldiers before. In 2000, members disguised as U.N. soldiers, with a mock white U.N. vehicle, kidnapped three Israeli Defense Forces soldiers and a reservist. Sheik Nasrallah declared the reason was to trade them for militants held by Israel, and three years later, it worked. In a German-brokered deal, Hezbollah turned over the reservist and the bodies of the three soldiers (they had been killed). In exchange, Israel released 430 prisoners from Lebanon, Jordan and the Palestinian territories.